The best mini fridge can prevent perishable foods or drinks from spoiling when you don’t have room for a larger refrigerator. The greatest benefit of owning a mini fridge is the convenience because you can easily move it between rooms. It can be used in a backyard, near a swimming pool or in a bedroom. You can place them under your work desk to keep your lunch and your drinks cold. In your study, or next to your couch, the applications are plentiful. A small mini fridge is lightweight and requires minimal space. 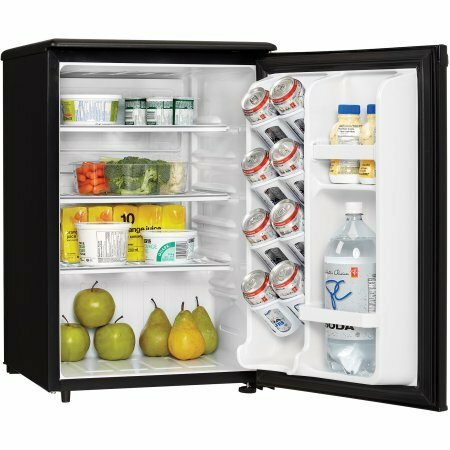 If you’re renting a room or living at a college campus, a mini refrigerator can be very convenient. There are living environments that aren’t large enough for a standard refrigerator, so your only option is a smaller alternative. It’s not uncommon for consumers to use mini refrigerators for extra storage space. They can hold bottled drinks, frozen foods and extra meat. An additional benefit offered by the best mini fridge is electricity savings. If your living environment doesn’t permit the use of a large refrigerator, a miniature model could be a great product for you. You can use it to store all the foods that you’d place inside of a normal fridge, and a small mini fridge doesn’t cost a lot of money. Below, you’ll find reviews for some of the best mini fridge models on the market, and by selecting a product from the list, you can save yourself precious time and energy. The Danby Designer DAR026A1BDD is a compact fridge, and it features a capacity of 2.6 cubic feet. It carries the Energy Star label and uses less electricity than many competing products. The door inside of this refrigerator can hold up to eight cans, and it will hold all types of beverages. It features a scratch-resistant worktop and has no trouble holding tall bottles. If you’d like to add some class to a small office or bedroom, this miniature refrigerator might be a good fit. 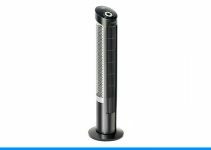 With a height of two feet, it can hold a wide range of products, and it features a powerful cooling capacity. To keep track of temperatures, it uses a mechanical thermostat. 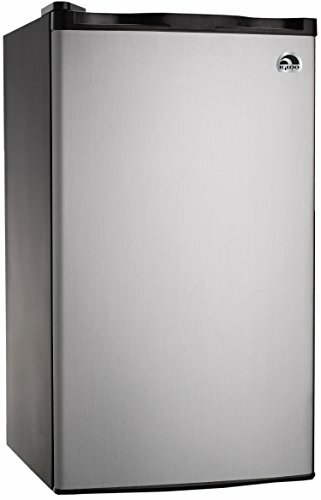 The Danby Designer DAR026A1BDD is a compact refrigerator, so it can fit in almost any small space. Despite its smaller size, it can hold a lot of perishable food. The RCA IGLOO 3.2 platinum fridge has an interior capacity of 3.2 cubic feet. It features a platinum finish, but you can choose from several different colors. For superior performance, this fridge uses compressor cooling, and since it has a reversible door, it can fit into almost any small space. With an adjustable thermostat, the RCA IGLOO platinum fridge gives you full control over the cooling temperature. A set of slide-out shelves make cleaning easier and provide plenty of space for perishable foods. This compact refrigerator is designed for reduced power consumption, and with a built-in bottle holder, it’s great for drinks. 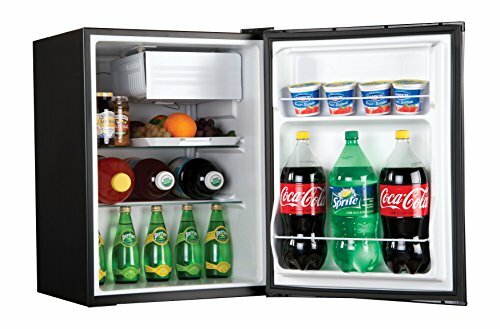 If you’re looking for the best mini fridge that you can use in your playroom, kitchen or dorm room, then this product is worth considering. It can keep drinks at the perfect temperature, and it even has a built-in freezer that can be used to store ice cream and leftovers. The Midea WHS-65LB1 compact refrigerator has a capacity of 1.6 cubic feet, and it’s available in several different colors. It uses an adjustable thermostat to give you full control over the cooling temperature, and it has built-in technology to keep the temperature constant. With a reversible door and adjustable leg, this fridge can be used almost anywhere, and when compared with many competing models, it saves energy. It’s also one of the quietest mini refrigerators on the market, so it’s a suitable choice for a rented bedroom or similar environment. 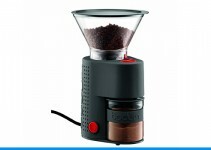 It comes with a separate chiller compartment, which is designed for cold beverages. The Midea WHS-65LB1 compact fridge comes with a great warranty, and although it’s one of the smallest mini fridges available, it big enough to hold a few meals and drinks. 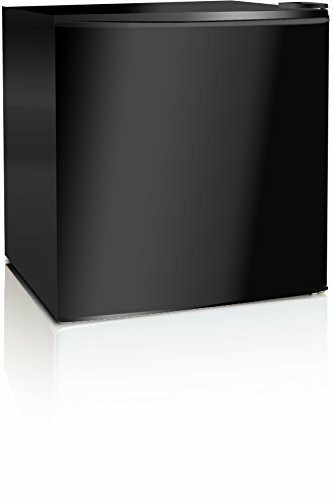 The Hisense RT33D6BAE compact refrigerator has an average capacity, and it offers 2.3 cubic feet of interior storage. However, unlike many competing models, it includes a built-in freezer compartment, which offers one cubic foot of storage space. To make food easily accessible, the Hisense RT33D6BAE has two glass shelves, which are designed for easy cleaning. For those nights when you’re half asleep and stumble your way to the fridge for a snack, the Hisense RT33D6BAE has an interior light that illuminates the contents. 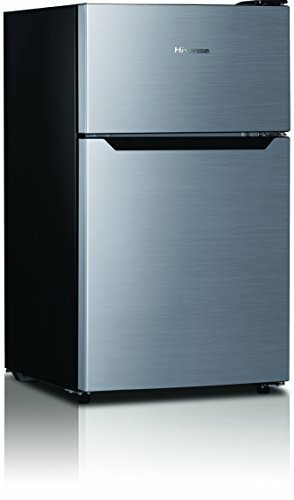 This small mini fridge has compact doors, and since it’s certified with the Energy Star label, it uses less electricity than many competing models. There are several other mini fridges on the market that claim to have a working freezer, but the freezer doesn’t work nearly as well as you’d think. 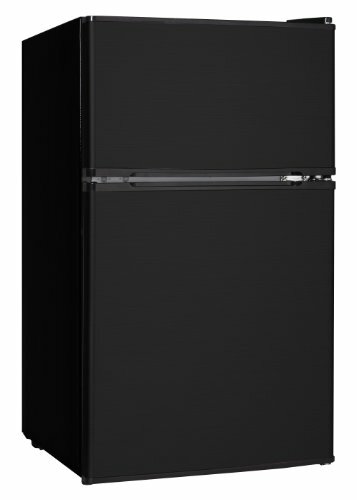 The Hisense RT33D6BAE is one of the only compact refrigerators that has a freezer that works well. 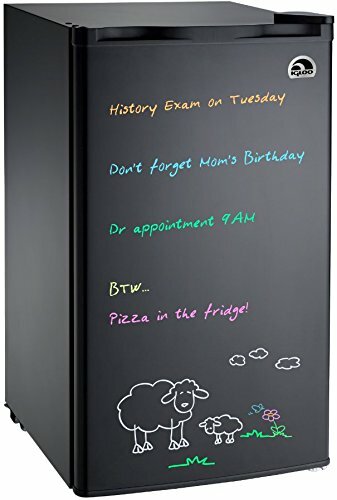 The Igloo FR326M-D-BLACK is a unique mini fridge because it comes with a built-in dry erase board. You can write on the board and leave important messages for family members. Since the front door is a dry erase board, everybody will see the messages left on it. Although the dry erase board is useful, it’s the capabilities of the fridge that are most important. The Igloo FR326M-D-BLACK has an interior storage capacity of 3.2 cubic feet, and it also has a built-in freezer compartment. A reversible door makes it easier to place in compact spaces and delivers additional convenience. An adjustable thermostat allows you to fully control the temperature and choose an ideal temperature for your perishable food. The Igloo FR326M-D-BLACK also has a tray for ice cubes, and the glass shelves slide out easily. 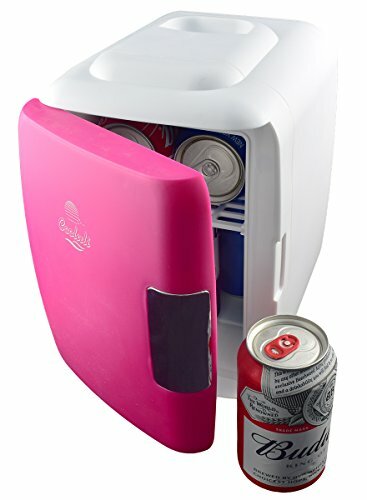 This best mini fridge is engineered for use in a play room, dorm, kitchen, small office or bedroom. The Midea WHD-113FB1 is available in several different colors, and it comes with an adjustable temperature control. To make it easier to quickly identify your food items, it has a powerful interior light. For greater convenience, it has adjustable legs, and the door is reversible. Since it has a drawer, you can separate your fruits from vegetables, and the entire fridge comes with a one-year warranty. With 3.1 cubic feet of space, this compact refrigerator can hold a variety of different items. It’s designed to save energy and produce minimal noise. Unlike many competing products, it has a working chiller compartment. Midea makes and sells some of the best refrigerators on the market and focuses on creating high-quality products. 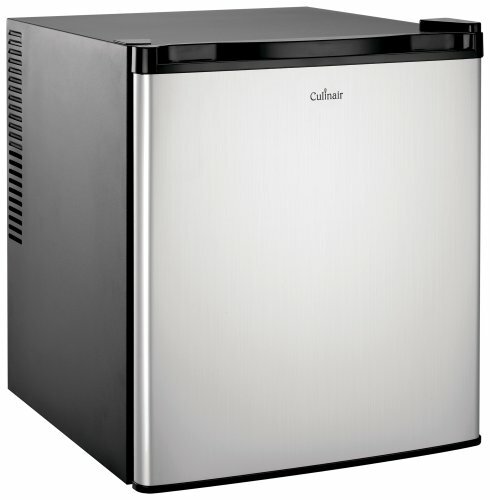 The Culinair Af100s has an interior capacity of 1/7 cubic feet and uses thermoelectric technology. To give you full control over food temperature, this small mini fridge is equipped with a convenient temperature controller, and it also has a built-in feature for automatic defrosting. The Culinair Af100s features a flush back and has adjustable feet. For convenient positioning, it has a reversible door, and it’s designed to produce almost no noise. Since it produces minimal noise, it’s a great compact refrigerator for small bedrooms. If you rent a room and need a way to keep your food cold, then this refrigerator is worth considering. The Culinair Af100s can cool its contents down to 51 degrees Fahrenheit, which is cold enough to keep most types of perishable food in good condition. This compact refrigerator could be a great fit for a nursery, bedroom, bar, office or dorm room. Haier is known for making high-quality products, and the Haier HC27SF22RB is one of the best compact refrigerators that they offer. With a capacity of 2.7 cubic feet, this best mini fridge has enough space for several food items. For greater versatility, it has a half-width freezer compartment and ice cube tray. It has two full-width interior wire shelves, which are ideal for beverages. It also comes with two full-width door storage shelves, and they can be used for storing beverages. The Haier HC27SF22RB is large enough to store two-liters and large bottles, and it’s designed to save space. It has adjustable leveling legs and gives you full control over the temperature with an adjustable thermostat. The Haier HC27SF22RB isn’t the largest mini fridge sold by Haier, but it’s one of the most popular. If you’re looking for a true compact refrigerator, the Cooluli mini fridge is worth considering. 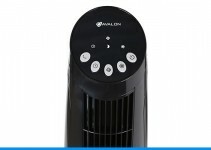 It can be purchased in several different colors, and it can be switched from heating to cooling. With a thermoelectric system, this fridge is easy to switch between heating and cooling modes. Depending on your needs, you can use it as a beverage cooler, or you can use it to warm milk. Although this best mini fridge is designed for beverages, it can also hold perishable food. However, due to its tiny size, you won’t be able to fit a lot of food inside of it. You might find this product useful for a dorm room, office or nursery. 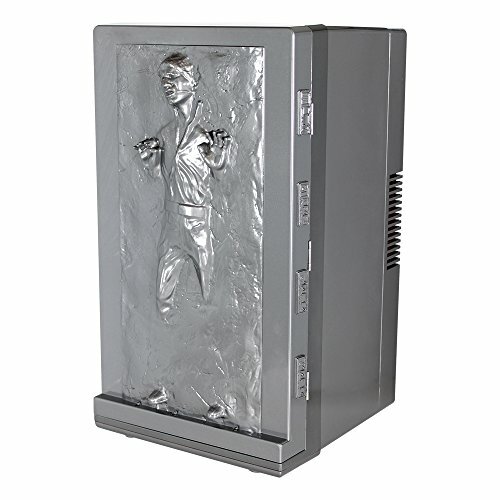 Here we have a compact refrigerator that is an excellent choice for any Star Wars fan. Since it’s officially licensed, you can purchase and use it as a collectible item, and it’s great for preventing your perishable foods from expiring. This mini fridge can heat and cool products, and it can even be plugged into a car. Although it’s ideal for holding up to 18 canned beverages, it can be used to store a small amount of perishable food. With special lighting effects for the exterior part of the door, it’s an excellent product for any fan of Star Wars.